I'd like to share with you a straddle option strategy which I think works very well and at the same time, lowers your overall risk in each trade. The other side to it is that it can also reduce your profit potential - though not necessarily. But I like the idea of quickly eliminating risk and putting yourself in a position where, whatever happens next, you can't lose money - you can only make it. In case you're reading this and don't yet understand what an option straddle trade is ... it's simply the simultaneous purchase of an equal number of call and put options using an at-the-money strike price and preferably with an expiration date of at least 90 days out. You can use shorter option expiration terms but this increases your risk of theta (time) decay which erodes your profitability potential. You also want to give yourself as much time as possible for the trade to show a profit. Straddle trading is not a day trading strategy. It is a more passive, longer term option trading approach. You can use straddle positions with short term expiration dates along with share purchases based on the options delta but this is a more advanced straddle option strategy called 'gamma scalping'. 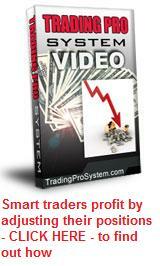 For more on this, take a look at the bonus video files in the Trading Pro System by Tradingology. 1. Do your normal analysis and decision making with regard to a conventional straddle setup. Check that the implied volatility in your option entry prices is low and that upon analysis, the (greek) vega is a number of times greater than the (greek) theta at entry. If you don't know how to check this, open an account with ThinkorSwim or any other reputable options broker. Their trading platform supplies you with all this information. 2. As soon as your initial order is filled, immediately set a "good till cancelled" sell-to-close order for BOTH the call and put options in the trade at an amount at least equal to the entry price for the entire straddle option strategy. So if say, it cost you $2.35 to enter the whole straddle trade, set your exit prices for calls at about $2.45 (to cover brokerage) and do the same as a separate order for the puts. You don't care which one reaches the target exit price first because once it happens and one side of the straddle is closed, you now effectively have another option position open which has cost you nothing. Whatever happens from here on, you CAN'T LOSE MONEY! You can now choose to immediately close out the 'losing' position, knowing that whatever you receive for it will be your overall profit. Or you can continue to hold the position in the hope that the underlying will retrace enough to give you a better profit. From here on in, whatever value your brokerage account tells you the remaining option position has, this is the profit you can take at any time. The worst that can happen is that the option eventually expires worthless - but you have lost nothing since you have already covered your entry cost from the profit taken on the winning side. This is a beautiful straddle option strategy with a great 'sleep at night' factor. You just set it and walk away. Soon you will receive notification that one side of the straddle has closed for your original cost. You now have your original capital back to use for other trades and you monitor the remaining position for exit opportunities. Since you're looking for the underlying to move in one direction then bounce back so that you can take some profits on the other position, you might like to consider a stock that is currently trading in a channel. The more horizontal the channel the better, but directional channels can work just as well. You simply time your entry at a point where the underlying is at the channel's midpoint. Make sure the channel is wide enough for one of the option positions to make enough profit to cover the cost. So if the stock price falls to the channel support level, the put option gains cover the cost of the entire trade and you then wait for it to bounce northward to increase the value of your call options for overall profit. If it doesn't bounce and continues to fall ... who cares? You can't lose now anyway. There are two situations that would prevent me from considering this straddle option strategy. The first is on a stock that doesn't show much historical price volatility. You want a stock that you expect has a high chance of moving enough in the short term to achieve your objective. A casual look at a one year chart will give you a good idea how far a stock moves in a month. The second situation is where the underlying stock is forming a 'symmetric triangle pattern' - higher lows and lower highs converging towards a point. These patterns are often followed by an explosive breakout. So when you see this happening, I would be more inclined to enter my straddle position and simply set an OVERALL profit target for the entire position. Why? Because once it breaks out in either direction, it's more likely to continue so that your 'losing' position has a much lower probability of ever showing some real value.